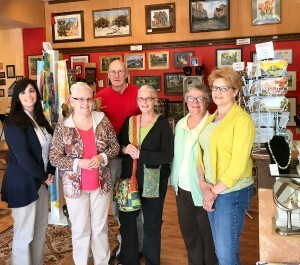 OSWEGO – Recognizing Oswego County has named Lakeside Artisans as Community Champion for the month of May as part of its focus on Arts Appreciation. “The arts, in all its diverse forms, enrich and entertain us and enhance our overall well being,” said Brandon Morey, ROC co-chair. Recognizing Oswego County member Jackie Wallace visits Lakeside Artisans, May Community Champion for Arts Appreciation. From left are: Wallace, Michele Southgate, Tim Ames, Bonnie Sommers, Carol Burghart and Cindy Schmidt. A theme is selected each month and nominations for Community Champions are solicited. Lakeside Artisans is located at 191 W. First St. in Oswego and is owned and operated by local artists. The quest toward an artists’ co-op in Oswego began in 2010 with Michele Southgate and Tim Ames and the Next Great Idea Competition. Ames’ background in business helped as they wrote their business plan for the competition. Their efforts paid off and Lakeside Artisans won the $25,000 prize. Currently, Lakeside Artisans has 20 artists in its co-op. Eight of the artists are responsible for running the store and the others sell by consignment. The group is always looking to add more artists, but entry is competitive. “New applicants are juried into the co-op, only being accepted if they meet the criteria for fine art and fine craft. This rigorous evaluation of new members is part of our business plan and allows us to offer a variety of unique, high-quality artwork in our store,” said Southgate. Lakeside Artisans is also an active part of the community, sponsoring other local organizations and offering art classes at the YMCA, schools and camps. Its members offer a variety of classes throughout the year, including a recent Paint (and Wine) Nite at Bistro 147. Southgate said that the goal of the group is to give people an appreciation for art and what it means to be creative. 7. Local art stores enliven our downtown and beautify our city. For June, Recognizing Oswego County is seeking nominations in the area of Historic Preservation. Nominations are due by June 9. Monthly meetings are held from 8-9:15 a.m. on the second Thursday of each month at the Oswego County Federal Credit Union, 90 E. Bridge St.